Abusing drugs is dangerous and far too often results in an overdose, but mixing them can be a death sentence. Some of the most dangerous drug combinations have showed up in the deaths of celebrities such as Cory Monteith, Michael Jackson, Heath Ledger, Anna Nicole Smith, Philip Seymour Hoffman, Chris Farley, John Belushi, and Elvis Presley. There are many more, as well as a long list of celebrities who overdose and died on a single drug. The body doesn’t care if the drugs were obtained legally or illegally. It will stop beating when it can take no more. Everyone’s body chemistry varies slightly, which makes it nearly impossible to know what combination of drugs is the most deadly for a particular person. Mixing prescription drugs with over-the-counter drugs can also result in death. Illicit drugs and alcohol send thousands to the emergency room every year. 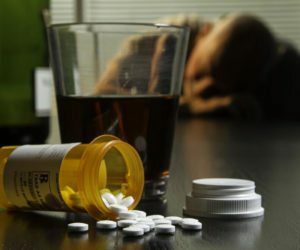 Opioid painkiller overdose can be deadly by itself, but when combined with alcohol sends thousands of people to the emergency room every year. These dangerous drug combinations result in death from respiratory failure. Benzodiazepines and alcohol cause respiratory failure. Never let a friend who has taken this combo “sleep it off” because it is more likely they will never wake up. Cocaine and alcohol taken together form the toxic chemical, cocaethylene. This chemical causes serious damage to the heart, liver, and other organs. Benzodiazepines combined with painkillers and/or sleeping pills is a recipe for respiratory failure and death. People showing up in the emergency room suffering from this toxic combination is on the increase. Cocaine and ecstasy (MDMA, Molly) are both stimulants that cause damage to the cardiovascular system and body temperature regulation. The unknown factor is the cutting agent used with these drugs. It’s a Russian roulette scenario, and chances are high that the user will lose. Cocaine and opiates combined have ended the lives of several well-known celebrities. This toxic blend plays havoc with the cardiovascular system and can cause heart attacks, seizures, and stroke. Respiratory depression is also a risk along with unregulated body temperature. Ecstasy and anti-depressants are deadly. The antidepressant reduces the effects of the MDMA and so the user takes more ecstasy to reach euphoria. At this point there is the real risk of serotonin syndrome which leads to stroke, shock, severe hypertension, and coma in a matter of minutes. Serotonin syndrome is a drug reaction that causes the body to have too much serotonin and can be life-threatening. The news is full of stories regarding the fatal drug interactions between alcohol, opioids, and benzodiazepines. Less publicity is given to the deadly interactions between illicit street drugs and prescription pain killer. Street drugs include heroin (smack, brown sugar, junk), cocaine (candy, snow, blow), and MDMA (ecstasy, Molly). Many fatal drug interactions occur because there is always the potential for unknown ingredients to be added to any illicit drug by the unscrupulous “street chemist” who will use any substance to expand the amount of his or her product. Deadly illegal drug combinations frequently include other substances in order to maximize the dealer’s profit. Talcum powder, benzocaine and lidocaine and other over-the-counter medications are cut into the street dealers drugs. This increases the risk of overdose, heart, and liver problems. Drugs are harmful enough when they are pure, but when cut with an unknown the risks are high. These deadly illegal drug combinations send people to the emergency room and sometimes the morgue. If you or someone you love is struggling with drug addiction, don’t risk becoming a statistic. Call WhiteSands Addiction Treatment Center, and learn how they can help you overcome addiction and restore your life.